Experience has taught us that sailing on the Fourth of July is just not our scene, but there are always OPBs. 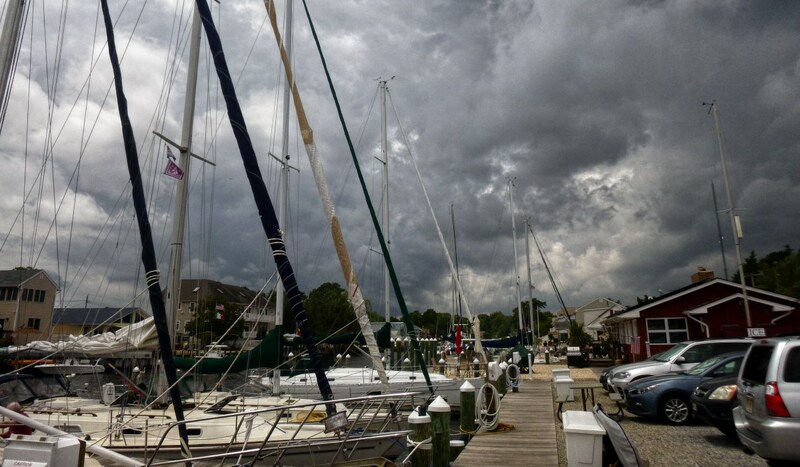 On Friday, we were supposed to sail the final race of the Summer Solstice Regatta. The wind forecasts were calling for gusts into the high-30s, and I had already warned Sailor Steve that I probably wouldn’t be racing in that. We’ve been out in those conditions before, and I had every confidence that we could technically get the boat around the course, but we were well out of the running for this regatta and not competitive against the larger boats in heavy weather, so I could see no reason for sailing heroics. As it turned out, the race was cancelled. The crew of Tiki still wanted to go for a sail, and asked if we wanted to join them. Tiki is a big Pearson 36-2, and I thought it would be fun to go tackle some weather in their boat. I helped them change to a smaller jib and the crews of Mystique, Island Breeze, and Lucky Star II joined us. Then the crews of Bad Dog II and Restless came aboard. Then some other bystanders joined us. As they were counting the life jackets, I was concerned that a decorated Volkswagen would come honking into the marina to calliope music with fifteen clowns to hang off the rigging. The cockpit was so overloaded that Jen and I sat on the foredeck. Of course, the foredeck isn’t exactly where you want to be when it’s blowing over 30kts, which it was before we even left the shelter of the creek. The bay was churned up, with lots of fetch from the southerly wind, and we were immediately taking spray over the bow. With the boat loaded up like a refugee barge, they made the [sound] decision to not deploy the sails, so we had a brief motorboat ride. Having the seen the conditions firsthand, I was glad that they cancelled the race. As we were coming in, Sunset was going out, sailing down the creek channel on a small jib. I tried to take a picture, but it was tough to operate a camera. The bay always looks flat in photos anyway. I stayed on the boat Friday night with the intention of sailing Saturday morning, despite our general rule about not sailing on Independence Day weekend. Between the heat, the moderately high wind, and the potential for boat traffic, we decided that we should just motor over to Governor’s and have a swimming day…except that Jen didn’t bring her bathing suit. Actually, she only had half of one. We had a lengthy discussion about how this is possible. I thought that she lost or forgot the other half, but it turns out that you can buy half a woman’s bathing suit, which makes me wonder 1) why would you do this? and 2) why it’s even called a “suit” if you can buy mismatched sets. We made the difficult decision to celebrate the weekend by doing something truly American, and made a trip to The Walmarts for a really nice emergency half-a-bathing suit. We narrowly escaped, although by then it was fully raining. We drove out of the rain cloud on the short drive back to the marina, but the sky looked ominous, and we decided that it wasn’t in the cards for us to sail. When we got back home, I had a message from someone on the sailing forums, asking me if I wanted to help him sail his new-to-him Marshall Sanderling on Sunday. 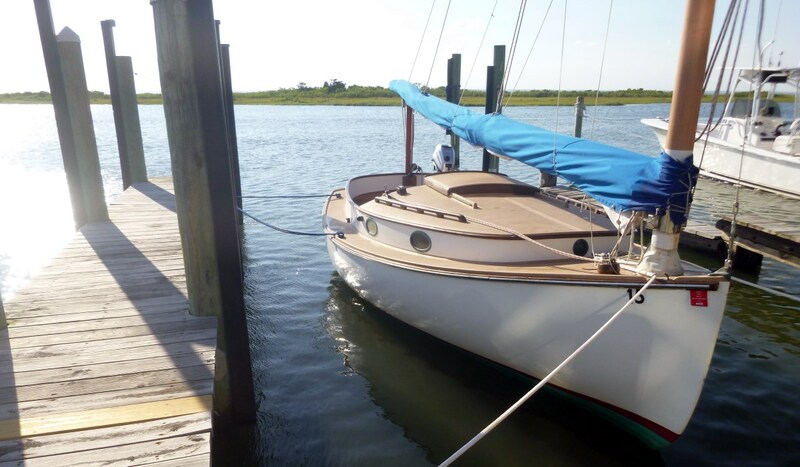 A Sanderling is a classic 18′ catboat—one of the oldest boats in continuous production, going back to 1962. The only catboat I’d ever been on was a Beetle Cat that I sailed out of the Antique Boat Museum in Clayton, NY, so I jumped at the chance. Shore traffic was intense. It took me an hour to get from the Parkway exit on 72 to the Manahawkin Bay Bridge, and I was a little late getting to the boat in Beach Haven. The skipper had the boat all prepped and ready to go, with a reef already in the huge sail, and we quickly made our introductions and started untying dock lines. 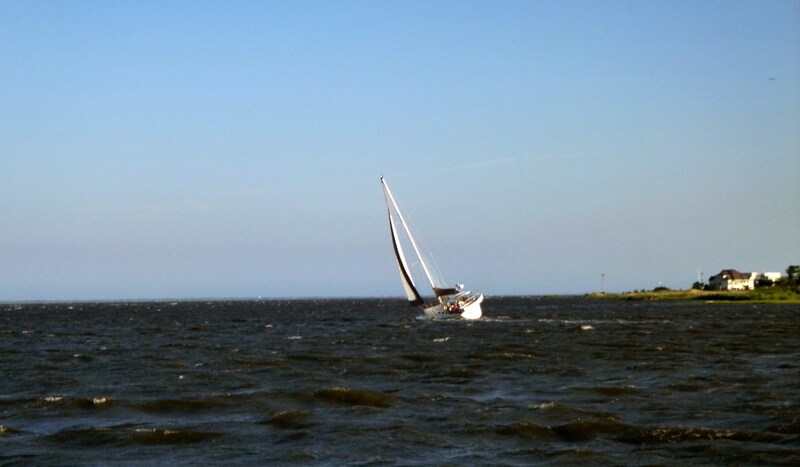 He was new to sailing, and I wasn’t sure what he knew beyond his ASA 101 class. I was initially a little confused when we allowed the boat to drift out of the slip, tied the bow to the end piling, then let the boat blow head-to-wind to raise the sail, but it worked fine. 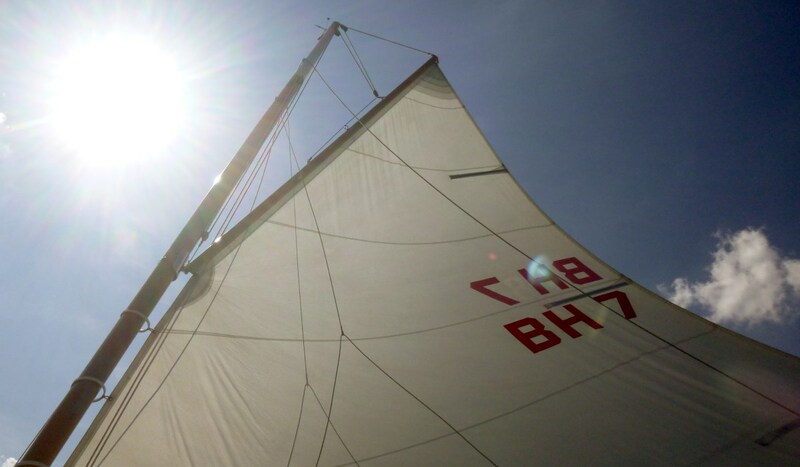 Once underway, the skipper handled the boat well under both power and sail. We tacked back and forth several times across Little Egg Harbor with surprisingly little boat traffic to contend with. I even took the helm for a bit, and found the boat really pleasant to sail. It’s pretty much the perfect boat for Little Egg, with a shallow draft and a lot of form stability from her wide, flat hull. Jen and I have received a lot of help from the sailing community over the years, and I still feel like I’m in the hole on karma. It was nice to lend a hand, even though I probably wasn’t necessary…he’s got it figured out. It’s a beautiful boat, and we wish them all the best.